Isolated but far from impotent, Sharpe and his trusty riflemen hold off vast Napoleonic forces in the Portuguese wine country. With years to go before the Corsican Menace is safely quarantined, there is never any doubt but that intrepid, supremely resourceful Richard Sharpe, amiable hero of 18 previous outings (Sharpe’s Prey, 2001, etc. ), will prevail, though Cornwell, always using good history and always explaining where he has fantasized, never fails to engross and beguile. 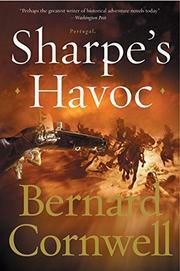 Sharpe is every gentle reader’s secret vision of his or her own self: the victim of idiotic superiors, the idol of his troops, unsure of his place in the world, utterly sure of his place in battle. And doesn’t he go to the loveliest places! Now he’s in greater Oporto, home to the great red wine and the great English red wine–exporting families, where Bonaparte’s troops threaten the city and such lovely citizens as Kate Savage, heiress to House Beautiful and a port fortune, who has disappeared. Sharpe is on the scene because he and his riflemen have been cut off from their battalion and because shrewd Captain Hogan needs him around for the odd commando task. In this case, the task is dual: find Kate and keep an eye on a certain slippery Colonel Christopher. Hightailing it out of the city as the Emperor’s troops invade, Sharpe is witness to the disastrous collapse of a bridge and is near victim himself of a French ambush. His bacon is saved by a band of Portuguese irregulars led by Lieutenant Vicente, a young philosopher-lawyer-poet learning army tactics on the fly. Sharpe and Vicente’s united little bands find their way to Kate Savage’s country estate, where Kate is about to marry the perfidious Colonel Christopher. How perfidious? Not only has he arranged a bogus wedding mass, but he’s busy playing off subfactions of the French against each other. Fool that he is, the Colonel, like the French, fears nothing from the obviously ill-born Lieutenant Sharpe.